KIGALI (Sputnik) - Russia and Rwanda are discussing possible supplies of Russian air defense systems to the African nation, Russian Foreign Minister Sergei Lavrov said Sunday. "We have good cooperation in the area of military technology. Rwandan security forces, army, police have our helicopters, cars… small arms. Now, we are discussing supplies of air defense systems," Lavrov said at a press briefing. Lavrov is currently visiting Rwanda and is holding talks with Rwandan President Paul Kagame and Foreign Minister Louise Mushikiwabo. Lavrov also addressed the economic cooperation between two countries. "We have various projects being implemented in particular areas, in some areas we will have to transform the agreements into concrete steps. Particularly, I mean the area of cooperation on the peaceful use of nuclear energy," he said during the press briefing. The foreign minister also added that there is mutual interest in the development of cooperation in such areas as agriculture, medicine, mining and geological exploration. The Russian minister laid a wreath at the Kigali Genocide Memorial and visited the museum of the history of the genocide against the Tutsi ethnic group, paying tribute to those who died in the tragic events of 1994. "I deeply empathize with the national tragedy of the people of Rwanda. The terrible tragedy, which afflicted it 25 years ago, remains an unhealed wound in the hearts of millions of people. We must do everything to ensure that such crimes never happen again. We must vigorously oppose xenophobia, racial and religious intolerance. This is invaluable what [Rwandan] President Paul Kagame is doing to strengthen inter-ethnic peace and harmony in the country," Lavrov wrote in the memorial's guestbook. Rwandan Foreign Minister Louise Mushikiwabo, in his turn, said that Russia could play a crucial role in peacekeeping on the African continent. "Rwanda wishes to collaborate more with Russia especially in fostering peace and security on the continent. We believe that Russia could play a crucial role, particularly in peacekeeping in Africa," she minister stated following her meeting with Russian Foreign Minister Sergei Lavrov. Mushikiwabo also stressed that Lavrov’s visit to Rwanda was an important step in relations between the two countries. "We had the opportunity to work together before. This visit marks an important step in our bilateral relationship. We have agreed that we will see more of each other in each other’s capitals. And we will also be organizing a presidential visit," she stated. 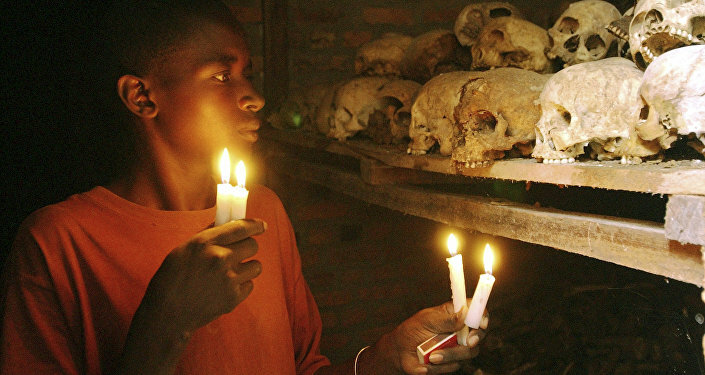 The Rwandan genocide was the mass slaughter of country's Tutsi minority by Hutu extremists, which resulted in 800,000 deaths according to UN estimates. The killings, which lasted from April to July 1994, were triggered by a nearly four-year civil war between the Hutu-led government and Tutsi-led Rwandan Patriotic Front (RPF).